When Christians speak of evangelism, they are usually referring to efforts to fulfill the Great Commission. This Gospel of Jesus Christ is very simple. It is a message that even a child can understand. It is about Gods plan to save us from our sins. Unfortunately, Satan has always had an agenda to complicate the Gospel or confound people into believing in something less or something more than what the Gospel message teaches. Paul talked about 'another gospel' when he warned the Corinthians (2 Corinthians 11:4) and the Galatians (Galatians 1:6) about the dangers of being deceived. Satan is a clever schemer. Deceiving people in the name of the Savior is part of the devils ultimate plan. Not everything labeled the gospel is the true Gospel. 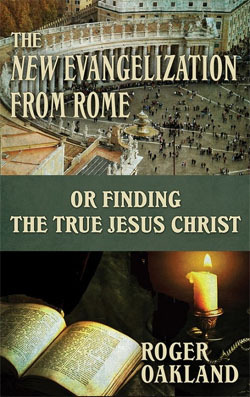 Further, it follows that the term evangelization, if it is based on a counterfeit gospel, will seduce people into believing they are going to heaven, when instead they may be on their way to hell. we will be dealing with The New Evangelization, a program currently being promoted by the Catholic Church and designed to win the world to Christthe Eucharistic Christ. This Catholic program is committed to Our Lady of Guadalupe (Mary).6 Remember, Paul warned the Corinthians about another spirit that was associated with another gospel and another Jesus'. This Eucharist Jesus is NOT the Biblical Jesus, but is taught to be physically present in the Communion wafer and wine, a most pagan and deceptive doctrine, The true Jesus becomes a christ of Roman Catholicism and could not be possible if Protestant Christians knew their Bible.